As part of an ongoing live series, this double CD features Dilute and Hella, two innovative and unique bands, who have both been held in high esteem for their dynamic and intense live performances. Each CD has 5 tracks by one of the bands. Dilute, from Oakland, CA, produce wonderful soundscapes that literally resonate with soul fire. Melodies bubble and simmer punctuated at times by sparse, childlike vocals. 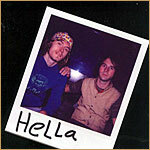 Originating from Nevada City, CA and now residing in Sacramento, Hella have blown away countless jaded hipsters with their intricate, winding spazz-core compositions. Zach Hill is a veritable animal on the drum kit, playing w/ a passion and intensity rarely matched. Spencer Seim's guitar work is equally impressive, as he bursts forth with a seemingly endless supply of pulsating, jittery parts that intertwine perfectly.